There are a few recipes, for favorite dishes, I wish I had asked my mother to teach me to prepare. She didn’t write down instructions for things like bread pudding or rice and raisins or collard greens, corn pudding, or fresh peas and potatoes. These were family favorites that she made by familiarity and intuition. There are days I crave these comfort foods the way I long for her words of reassurance. Now these secrets are forgotten or locked away in places I cannot reach. I’ve learned my lesson. I am blessed to have a mother-in-law, Alice, who is a role model. She’s kind, supportive, and compassionate – and has treated me like a daughter for my entire married life. At the center of her home is a long table, long enough to hold the 14 members of our family (and one more on the way). Family gatherings and meals are a priority for her and she has fed our family so many times I lost count long ago. 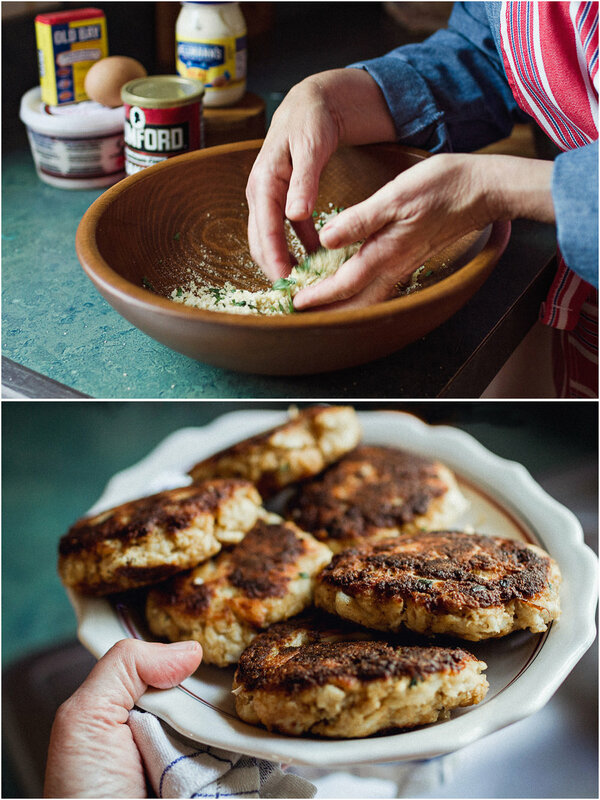 We all have our favorite meals, but everyone agrees – Alice makes the best crab cakes. And so, I set out to learn her method, and make homemade crab cakes for dinner this weekend. I called Alice to ask for the help, and she readily shared the recipe, straight from the back of the Old Bay seasoning can. By the next morning she sent an email my way. I want to add to my crab cake story. I mix everything except the crab meat together with a fork, and then fold in the crab meat. That way the crab meat still remains in some lumps. Then I refrigerate for about an hour before forming the cakes. It holds together better then. I learned this from experience. Old enough now to appreciate the wisdom that comes with age and aware of the value of experience, I enjoy learning in this way – as recipes and life lessons are passed down from one generation to the next. The crab cakes turned out just fine, a close second to Alice’s. Coming up . . . I’m going to learn to make Alice’s lemon meringue pie!